PERMODALAN Nasional Bhd (PNB) is poised to seal its fourth major property acquisition in London, which will put its overseas spending spree in recent times to well over RM5 billion. According to its president and group chief executive Tan Sri Hamad Kama Piah Che Othman, the country’s largest fund owner and manager was expected to conclude the deal by the end of the month, “We can’t reveal too much at the moment as it is yet to be completed,” Hamad Kama Piah said after announcing the income distribution of four of PNB’s funds here yesterday. He said more overseas acquisitions were imminent as PNB looked for “worthy” properties that could yield sustainable income. “We focused more on equity before this but we are now looking at investing in the property market,” he said, adding that London properties were not only cheap but also offered good prospects. “The tenants of these office buildings have signed 10-year to 15-year leases. They will notsimply exit,” he said. Reconstruction and Development and law firm Olswang Solicitors, respectively. 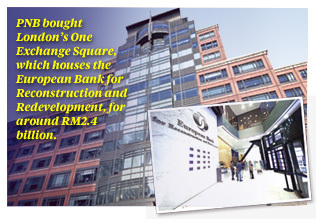 Earlier this year, PNB snapped up Milton and Shire House in Silk Street for ?350 million (RM1.7 billion). Hamad Kama Piah said including its property in Brisbane, Australia, PNB had spent about RM4.9 billion on property deals abroad so far. On whether PNB would be buying properties in countries it had offices in, Hamad Kama Piah said that would be a wise decision. PNB currently has offices in London, Singapore and Tokyo.